First-half goals from Chris Hutchinson and Harry Anderson left County Armagh with success by 2-1 across the Junior section against North Dublin Schoolboys’ League. The meeting in Ballymena’s Broughshane venue provided spectators with three goals before the break. Defensive errors accounted for two as North Dublin broke the deadlock by taking full advantage to pass the ball into the gaping goal. The equaliser by County Armagh featured a Dane McCullough free-kick delivery which Hutchinson was on hand to head home. 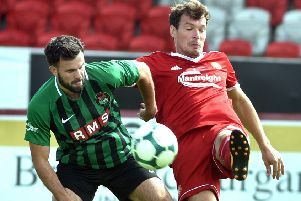 The decisive goal arrived when Anderson doubled his tally for the tournament with a simple finish following a mistake by the North Dublin side. “We now have four points from the first two Junior section games so must be delighted with the start,” said Dean McCullough, the County Armagh SuperCupNI Association chairman. “We created more chances in the second half and then defended well late on when under pressure from North Dublin. COUNTY ARMAGH: Sam Monaghan (Dungannon), Jason Dodds (Portadown), Dane McCullough (Portadown), Jesse Carson (Linfield), Jamie Haire (Portadown), Chris Hutchinson (Portadown), Harry Evans (Glenavon), James Black (Portadown), Matthew Willis (Glenavon), Alberto Balde (Portadown), Harry Anderson (Portadown). Subs (used): John McGovern (Windmill Stars), Jack Scott (Linfield).